I’ve finally had to admit it. I’m over-committed. I never planned to spam my blog followers with daily ramblings. Twice or thrice a month would suffice. But I’m down to one post a month. So why am I swamped? I’ll go into that next time. I’m too over-committed to write out a long self-pitying moan-piece today. In my Janus Paradisi novels, “Faces of Janus” and “Janus Challenge”, characters refer to a side adventure that didn’t make it into the novels’ final edits. May 2094: the Earth is failing. Its rich elites are fleeing the planet to a distant safe haven. The final ship is preparing to depart. The last batch of passengers race across the world to catch the space elevator to the orbiting ship before launch. Suicide bombers seek to destroy the elevator, launching tsunamis across the Pacific and cutting off access to the last remaining escape ship. Their only opposition is a security team chasing just behind. Will the dream of entering Paradise be destroyed? 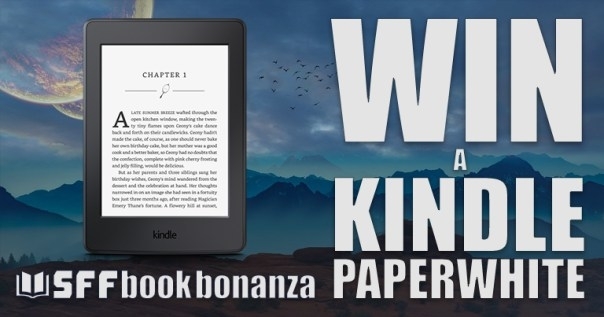 Enter this easy competition to win a brand new Kindle Paperwhite, sent straight to your door! This great Amazon e-reader comes packed with features, reduces eye strain, and is perfect for reading great Sci-Fi and Fantasy books. Looking forward to August 1st. Final Flight Launch. Pre-order? Time to contact Amazon. Thanks for the heads-up! I took the earliest possible re-set, 18th July… Ah, well.